Our stay here was incredible. Our arrival was delayed past 9pm due to our ferry’s late arrival. The host, Theodosia, greeted us as soon as we arrived and provided light snacks and water as well as offer a drive into town if we were hungry and wanted something to eat. She was also incredibly accessible and accommodating. Anything we needed or question we had, she was able to help. Even when we asked if we could stay by the pool after we checked out (due to a late flight) she let us use the area and offered us towels. She was such a generous and wonderful host. The property itself was also very nice. 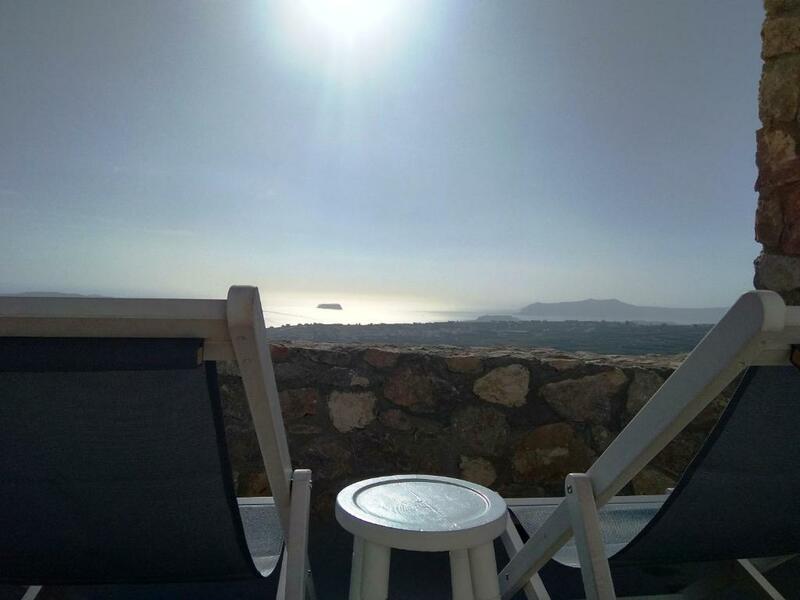 The pool area has an amazing view of Santorini, the kitchen is fully equipped, and the apartment spacious for the four of us traveling together. I would highly recommend staying here, and would look to stay here again if I return to Santorini. Theodosia was an amazing host, one of the best I've ever encountered in my world travels. Her recommendations were the best and she genuinely seemed to want us to have the best time on our visit. The view from our suite was incredible and we opted to stay there to view the sunset instead of going into Oia one night. It seemed like the hosts have thought of everything including restaurant delivery for breakfast, which we did and was amazing and awesome value for money. 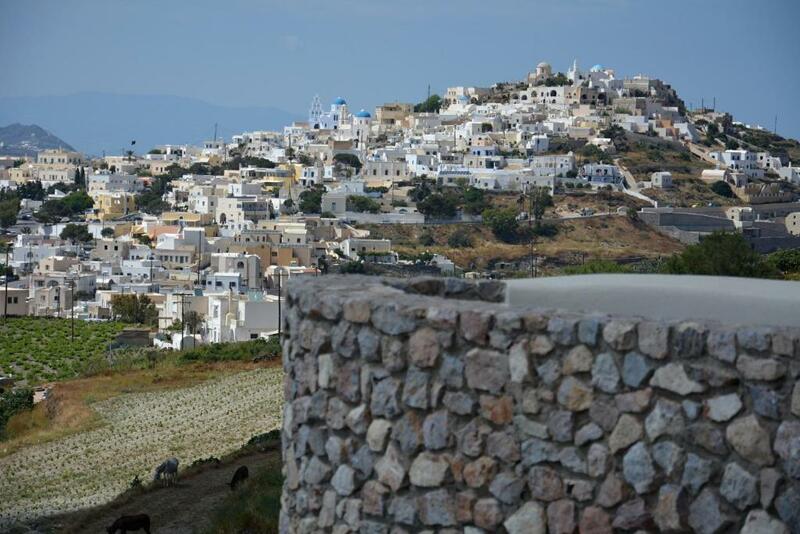 Pyrgos is very cute with nice restaurant, so even though about 15 minutes from Thira and 30 to Oia, plenty of stuff close by, including wineries to see in Santorini. I actually preferred this location and would return here if I came back to Santorini. Grounds were beautiful and even pomegranates growing in the yard. Can't say enough good things about the host, the pool, our hot tub, the room etc. Great host, always friendly, always helpful. Excellent views from the mountain, great sunsets thanks to the higher ground, further away from the noise of bigger villages. Great pool, the house in a perfect shape, clean and very well maintained. Our Hostess Theodosia was so amazing. She waited for our arrival (which was late) and greeted us at the gate. Which I thought was very hospitable and kind. She brought us to our room, and even had some food arranged for us to have for breakfast in the morning-since we arrived late and couldn't stop at a supermarket. What we really appreciated was her having maps ready and showing us all the island of Santorini and all the great places to check out and great places to eat. She really made our trip to Santorini go very smooth. Not to mention our Villa actually looked just like the pics. VERY BEAUTIFUL. 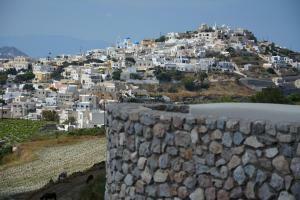 We rented a car for a great price and were able to visit all the places we wanted- Fira, Oia, Pyrgos, Kamari-just to name a few. Definitely coming back soon! Everything is 25min or less driving distance. Best sunsets. Private rooms, clean neat. Close to all areas and great views.....more Bang for your US dollar. The hosts were the nicest I ve ever come across. From start to finish Theo was so lovely to chat to making sure our stay was perfect she helped to organise everything we wanted always with a friendly smile. 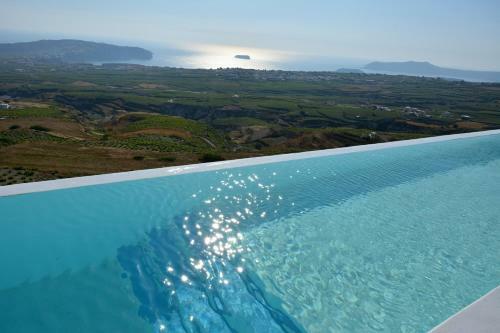 The view is the best in Santorini, even better from the hot tub. Anyone wanting to visit Santorini needs to stay here. Greeted fondly and all our needs were catered for throughout our stay, Theodosia is a fantastic host and I would highly recommend. Lock in a great price for Zatrikion Santorini Villas – rated 9.7 by recent guests! 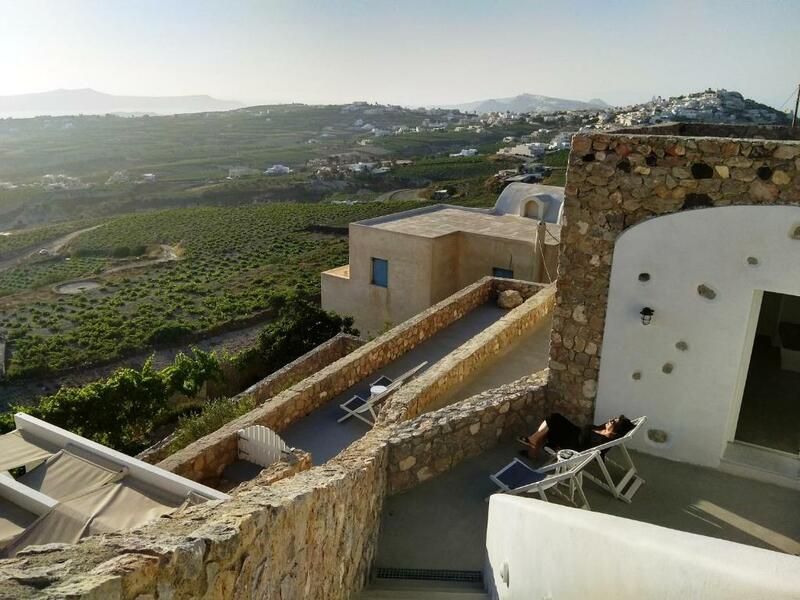 Located in the outskirts of the traditional Pyrgos village, Zatrikion Santorini Villas offers Cycladic-style accommodations with private hot tubs and views of the Aegean Sea. The village center can be reached within a 15-minute walk. Zatrikion Villas are decorated with respect to the local style and open out to furnished terraces with sun beds. They include a kitchenette with stovetop, fridge, microwave and coffee maker. There is also a seating area with a flat-screen TV, while bathrobes, slippers and free toiletries can be found in the bathroom. Athinios Port is 2.5 mi away and Santorini Airport is 3.1 mi away. Free WiFi is available throughout the property and free private parking is possible on site. 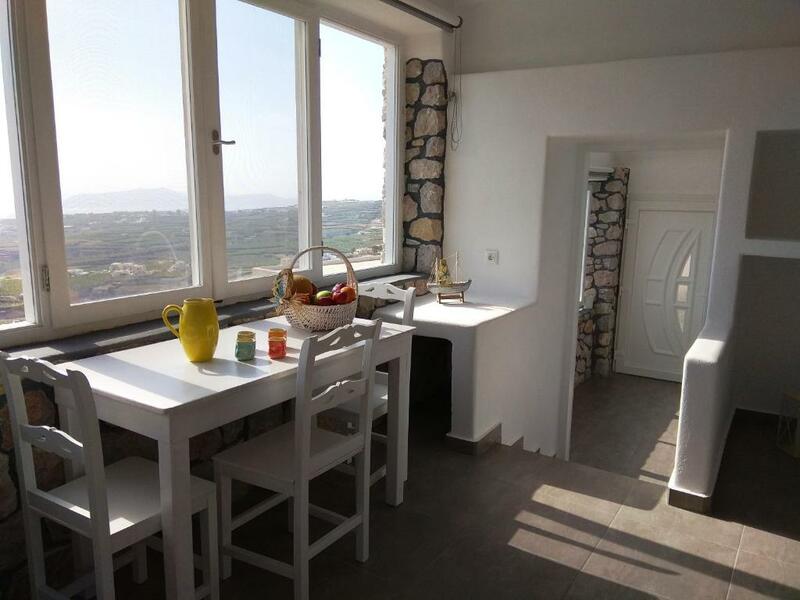 When would you like to stay at Zatrikion Santorini Villas? 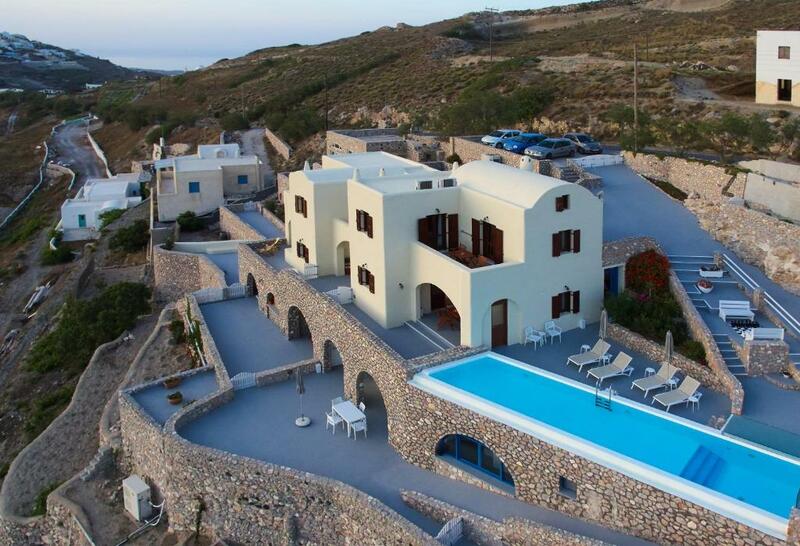 Cycladic-style villa with outdoor hot tub overlooking the Aegean Sea. It includes a fully equipped kitchenette, seating area with flat-screen TV and free WiFi. This villa feature a balcony/terrace views with views of ponds, rice fields, hills and coastlines. The private bathroom has a bath. House Rules Zatrikion Santorini Villas takes special requests – add in the next step! Zatrikion Santorini Villas accepts these cards and reserves the right to temporarily hold an amount prior to arrival. Please note that for bookings of more than 3 rooms, different policies and additional supplements may apply. 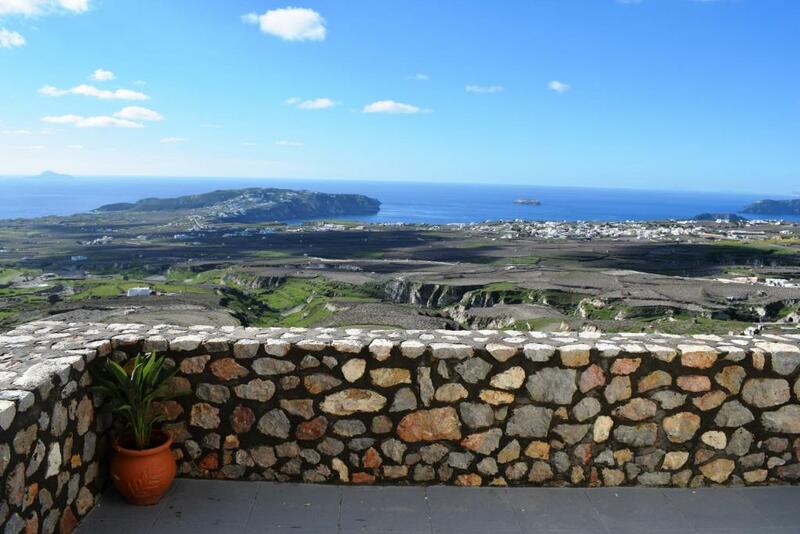 Please inform Zatrikion Santorini Villas of your expected arrival time in advance. You can use the Special Requests box when booking, or contact the property directly using the contact details in your confirmation. The only thing to mention is that the location is not super close to the main touristy areas. It is easy enough to get a taxi to places like Oia or Fira, but if you are looking to stay right in a touristy area then this might not be the best option. I was not looking for that so I thought this location was very good. Everything was perfect! I advice with all my hart this place! A wonderful view of the island, perfect position to go where you want. Theodosia simply a fantastic person, I'm so happy to met her! Thanks thanks thanks for all! My best holiday! This is by far one of the best booking.com stays we've had during our 3 week trip in Greece. The owner (and her family) was not only friendly and helpful, she always greeted us with a smile went out of her way to accommodate us for every single one of our requests. She responded promptly and in great detail to all questions asked prior to arriving at the property and even helped us with our rental car booking which saved us a lot of money, headache, and hassle. She even arranged for them to pick us up at the airport and for the car to be picked back up at the airport, which was a huge plus compared to the airport car rates. She guided us on the key spots to watch the beautiful Santorini sunset along with methods to avoid the crowds, and gave us excellent suggestions on shopping and meals. The villa unit we stayed in was clean, air conditioned, and had a great view of not only the property including the pool but also of the entire landscape reaching out to the ocean. Even the staff around the property was extremely friendly and the daily cleaning service completely exceeded our expectations. We couldn't be happier with our stay at the Zatrikion, and we are definitely coming back! The family couldn’t have been more welcoming & helpful. The view was incredible & the shared pool really fantastic. Welcome drinks, snacks while we settled in we’re lovely. Amazing Villa in a complex of 7 Villas, but each Villa enjoys it's own privacy! Our host Theodosia was simply amazing - she gave us so many great insights and tips, even took time to tell us about the history of the island and took excellent care of us!! We felt more like family or friends than guests :-D The view is simply breathtaking and the villas are close to a monastery and 3 minutes by car to the next city. Perfect location to start exploring the island. The Villa had everything we needed and more! Including coffee machine (and greek coffee maker!!). We can highly recommend and will definitely come again!! There was nothing not to like!!!! Facilities and host were amazing. Views were to die for. Place was very clean and neat. Beautiful and modern with Greek characteristics. Hot tub was clean and stunning. Kids had a blast!!!! Swimming pool was superb. Kitchen equipped with more appliances than any other. Cannot wait to visit again!!! !